The first is from St. Mark’s in Lumberton. Two years ago as a very small congregation—average worship in the high 20s—under the leadership of Pastor Volley Hanson, they stepped up in the wake of Hurricane Matthew. 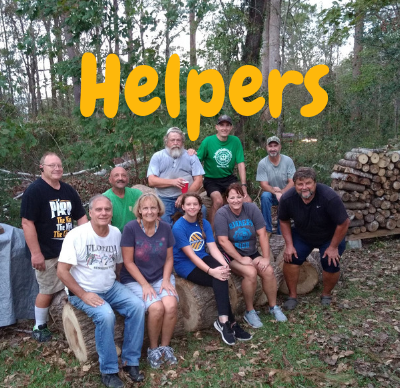 They transformed their church building and property into a distribution center for food, water, gift cards, and other non-perishables in this high-poverty community to help. Now, two years later, Florence is even worse than Matthew. St. Mark’s, without a regular pastor, has stepped up again and this very week have reopened their distribution center. They can use both money and volunteers. Helpers in congregations throughout the NC Synod and numerous other synods are sending money, people, and in-kind gifts. Lutheran Services Carolinas (LSC), our official Disaster Relief affiliate of the NC Synod, received the FEMA contract for case management after Matthew, and there are still a couple of dozen full-time case managers on the ground near Lumberton with LSC to help with flood recovery from two years ago. Likewise, Lutheran Disaster Response (LDR) employees are still there from two years ago. Both LSC and LDR employees still there after Matthew are technically precluded from addressing the recent Florence storm on company time, but many if not most of them have willingly and eagerly volunteered their time in addition to their Matthew responsibilities to help with hands-on Florence relief. The second story is St. Andrew’s in New Bern. You saw New Bern rescues from flooding on the news a lot two weeks ago. St. Andrew’s is a relatively strong congregation, averaging about 180 per week at worship. Most are retirees who have moved into this beautiful and historic community. Pastor Ted Rust shared with me last week that they can’t use their sanctuary currently. The roof was compromised, and the walls were soaked. The organ may not be recoverable. With no electricity and hot, humid conditions, mold has quickly overtaken the sanctuary. It is still unclear what and how much time and money it will take to make it usable again. Over a dozen church families have completely lost their homes and possessions, and everyone has home and yard damage of some sort. Even so, not only do they need helpers; they ARE helpers. St. Andrew’s, though using their fellowship hall now for their four worship services, is using that same fellowship hall to house volunteer relief workers from all over the east coast. Additionally, about 60 church members, all with their own damage and losses, are showing up daily and going into the community with chain saws, shovels, and all sorts of other help to accompany a hurting community. One last clarification of how we as Lutherans of the NC Synod respond to disasters. Lutheran Services Carolinas is receiving an initial $200,000 from Lutheran Disaster Response for humanitarian aid in eastern NC. We are grateful for the partnership of both of those organizations. So what is the synod’s specific role? In addition to Deacon Jo’s communicating and connecting, we are receiving “Hurricane Florence” donations of tens of thousands of dollars at the synod office. We are doing our best to triage congregational situations and push out that money to congregations (a)for their own relief efforts and (b)for minimal help with church building repairs and other needs that congregations can discern better than we can. LDR funds are not intended for church buildings, organs, or worship books, and several of our affected congregations have damaged buildings. Several affected congregations did not have flood insurance. Some who did have had their insurance claims denied, as in even though their buildings took on water, it wasn’t technically a flood. Though we won’t be able to make a huge dent in the financial challenges facing more than a dozen congregations, we can help, and even our sending them $5,000 from you and from other synods is a reminder and encouragement that we are the church together. We appreciate the helpers, and we need more. If you want to give money or form a volunteer team and don’t have connections to do so, email our primary disaster response contact, Deacon GeoRene Jones (Deacon Jo) at gjones@nclutheran.org.